In 1994, Liz Phair was coming off of one of the most critically-lauded debuts of the decade. With expectations set incredibly high, she put out the follow up, Whip-Smart, just 15 months later and while she could never escape the comparisons to Exile in Guyville, decades later, that second album still remains a gem. UMe, alongside Capitol is finally re-releasing a trio of Phair records from her time with Capitol. 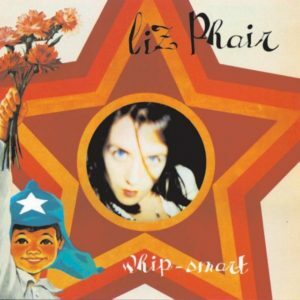 Coming in at 14 tracks, there is arguably a little bit of filler on Whip-Smart, but overall, it’s a remarkable record that would have gotten more praise at the time if Phair didn’t have to compete with her own debut. Songs like “Supernova” and “Go West” are among some of the best in her catalogue. Opting to go with Brad Wood again as producer, there’s slightly more sheen to the sound, but you certainly don’t lose any Phair’s bitingly witty lyrical appeal in the process. Whitechocolatespaceegg, initially out in 1998, is likely the weakest from this batch, but still houses a couple of Phair’s strongest tracks, “Polyester Bride” and “Johnny Feelgood,” both exceptionally executed alt pop songs that still hold up 20 years later. Phair’s self-titled effort, came out in 2003, her longest break between records at the time, and was an ambitious (considering her role as alt rock queen) pivot towards the pop music world. She even brought in The Matrix, a production team behind some of the biggest hit from Avril Lavigne, Britney Spears, Shakira (and oddly enough Korn) to work on five of the album’s 14 tracks. The idea to bring in The Matrix was her label’s suggestion after they were rumored to be left unimpressed by Michael Penn’s results. Predictably, this new direction alienated some of her earliest fans, but it’s hard to argue just how much fun this record was and still is. Songs like the amusingly raunchy “H.W.C.” and “Rock Me” are undeniably catchy. Both Whip-Smart and Whitechocolatespaceegg have been hard-to-find on vinyl for years, while her the self-titled album has never been pressed to wax before now. Whip-Smart is being released on a single 180 Gram vinyl LP, while both Whitechocolatespaceegg and the self-titled albums are spread across two LPs each.